Microsoft is leading a new vision of always on always connected devices, working with hardware engineering partners to achieve this. We live in a dispensation that device users want to be always connected. We yearn for devices that can outlive a days activity from a single charge. Whilst this hasn’t happened, Microsoft has been speaking with its partners about thinking this way. With updates and features in Windows 10 that point to this. Including accelerating a Move to the Cloud with Always Connected computing. At the Windows Hardware Engineering Community event (WinHEC) held in Shenzhen, China in December 2016, Microsoft chartered a course on building the next wave of modern devices for creators. Microsoft calls them modern PCs that support mixed reality, gaming and always-connected, more power efficient cellular PCs running Windows 10. This video gives you a glimpse into what the culture of Always Connected and Always On PCs are about. 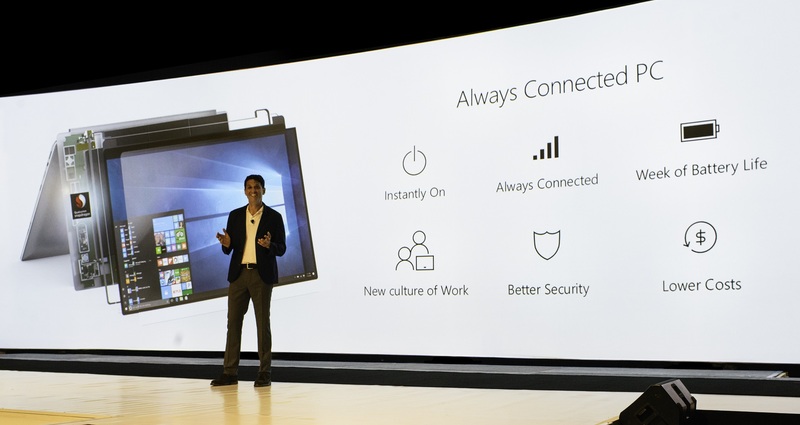 Last year at the Qualcomm Snapdragon Summit, Microsoft’s Windows and Devices Group Executive Vice President, Terry Myerson shared his experience trying out an Always Connected PC. One of the favorite parts of my job is trying out new products. Seeing the innovation, understanding how all the components work together, how it looks and feels, and ultimately how the customer will experience the product. For the last few months, I have been using an Always Connected PC, running on Qualcomm’s Snapdragon platform. In the last week, I watched the movie Moana with my daughter, worked in PowerPoint, browsed the web every day, reviewed budgets in Excel, checked email while waiting to pick up my son from soccer, marked up a few PDFs with Ink, played some games on the plane – all of this without plugging in my power cord all week. The PC is fast and responsive when I am using it and quickly goes into standby being incredibly battery efficient when I’m not using it. Always Connected PCs enable a new culture of work with better security at a lower cost. This year we are going to see the announcements of various devices by Microsoft OEM partners. Already there are announcements coming out of CES 2018 on this. How does having a PC that lasts for more than a week sound? Don’t get this wrong, some of these have powerful hardware specifications. I’m not sure how the eSIM and faster mobile networks in Africa will work with this but we will surely get around this. What are your thoughts? yeah, have you seen new devices from CES 2018 promising 20 hours of battery life and more?